Panama, a small nation of just three million, has the largest shipping fleet in the world, greater than those of the US and China combined. Aliyya Swaby investigates how this tiny Central American country came to rule the waves. Thanks to its location and slender shape, Panama enjoys a position as the guardian of one of the world's most important marine trade routes, which connects the Pacific and Atlantic oceans. For a hundred years the Panama Canal has provided a short cut for ships wishing to avoid the more hazardous route via Cape Horn. Dubbed one of the seven wonders of the modern world, the 77km (48-mile) canal is a feat of engineering that handles 14,000 ships every year along its intricate lock system. Many of these vessels fly the Panamanian flag yet the country itself has a limited history of trade. Panama only has one small shipping line as well as a number of companies providing supplementary maritime services around the ports and canal. Most merchant ships flying Panama's flag belong to foreign owners wishing to avoid the stricter marine regulations imposed by their own countries. Panama operates what is known as an open registry. Its flag offers the advantages of easier registration (often online) and the ability to employ cheaper foreign labour. Furthermore the foreign owners pay no income taxes. About 8,600 ships fly the Panamanian flag. By comparison, the US has around 3,400 registered vessels and China just over 3,700. Under international law, every merchant ship must be registered with a country, known as its flag state. That country has jurisdiction over the vessel and is responsible for inspecting that it is safe to sail and to check on the crew's working conditions. Open registries, sometimes referred to pejoratively as flags of convenience, have been contentious from the start. The first transfer of ships to Panama's register in 1922 involved two US passenger ships wishing to serve alcohol to passengers during Prohibition. More followed as shipowners sought to avoid higher wages and improved working conditions secured through US legislation. After World War Two, Panama's registry grew more rapidly as US shipowners sought to lower overheads while European ones switched flags to avoid high tax rates. As demand rose for open registration, other countries in the developing world formed their own. The US used Liberia's registry to build a fleet of neutral ships during the Cold War. Panama now has the largest registry in the world, followed by Liberia, the Marshall Islands, Hong Kong and Singapore. By last year, almost three quarters of the world's fleet was registered under a flag of a country other than its own. The registry is lucrative for Panama, bringing in half a billion dollars for the economy in fees, services and taxes. However, critics of the system point to the ease of hiding the true identity of shipowners and the lax enforcement of rules and regulations. Luis Fruto, representative of the International Transport Workers' Federation (ITF) in Panama, says the country turns a blind eye to its "responsibilities in order to acquire higher registration". The ITF has led a campaign against flags of convenience since 1958. It considers that Panamanian registration is better than some "from a safety viewpoint, but it remains seriously flawed in areas such as oversight, accident investigation and crew assistance". Two years ago, Mr Fruto investigated the death of a woman sailor, 22, on her first voyage. She became trapped in machinery that was reportedly faulty and died. The ITF says that, rather than heading for the nearest port as rules dictate, the ship continued to sail for more than two weeks with her body in a freezer. Further investigation by the ITF suggested that some of the shipping certificates had been bought. International legal requirements insist that countries operating open registries inspect vessels, comply with international regulations and investigate accidents and corruption. But critics say that Panama cuts corners in all these tasks, putting maritime workers at risk. Indeed, accidents involving Panamanian-registered ships are high. However, Carlos Gonzalez, former executive secretary of the Panamanian Maritime Authority, attributes this to a numbers game. Panama has the most ships and therefore the most incidents, he says. Since 2008, Panama has cut down on enough offences to move up from the black to the white list of the Paris Memorandum of Understanding, a watchdog comprising 27 maritime administrations from Europe and North America. Yet Panama's registry is consistently beset by allegations of corruption. In 2000, ITF general secretary David Cockroft was able to buy a Panamanian first officer's certificate for $4,000 to navigate a ship - even though he had no maritime skills or experience. Despite repeated assurances that the country was cleaning up its act, Roberto Linares, the head of the Panama Maritime Authority, resigned in June after it was discovered that workers were being certified without the proper qualifications. "The scandal brings us back to the days that Panama was called a 'convenience flag'," said Franklin Castrellon, former spokesman for the Panama Canal Commission, an independent agency operating the waterway until the country took over from the US in 1999. New leadership plans to turn things around again. 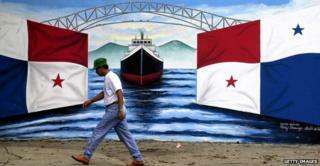 Jorge Barakat, the new head of the maritime authority, said: "The Panamanian flag is still robust and secure. Whatever kind of non-compliance there is will be reviewed by the administration." As a commercial venture, Panama's flag of convenience is a success. But according to the ITF, that comes at a cost. It believes the world economy could survive a ban on flags of convenience and the higher costs that it says would follow. ITF secretary Jon Whitlow said: "There would be some reconfiguration. The positive effects would include better protections and safeguards for seafarers who found themselves once again serving on a national flag ship." Shipping prices would rise, but free competition has extensively distorted the market, he says. However, defenders of the system say this thinking is outdated and that flags of convenience are here to stay. "Panama's registry will last for ever," said Jorge Luis Sanchez, professor at the International Maritime University of Panama. "Those who don't like the open registry can opt to do something else with their ships." Jazmina Rovi, former director of the Panama Maritime Law Association, said unions are better off enforcing uniform standards than eliminating the registry altogether. With the new maritime administrator sworn in last month, it remains to be seen whether Panama will crack down on corruption and safety breaches or continue to live with the taint that still clings to flags of convenience.